with Kristine D'Arbelles, Julia Kent and Ross Simmonds. Produced by Clare Bonnyman. This episode is brought to you by… you: our listeners. 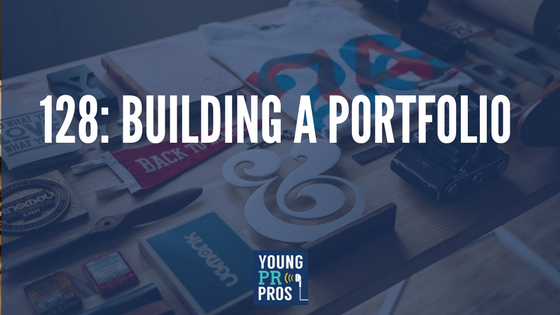 Will, a listener and fan of the Young PR Pros podcast, sent us an email asking us for advice on putting together a portfolio to help him land his next job. Thank you Will! This is such a great and important question. Portfolios are more than just pretty pictures and links to projects. A portfolio is your proof point behind every skill you promote in your job interview. It gives the potential employer a sneak peek at what you could bring to the team. What should you include in your portfolio? Ross encourages listeners to use real-world projects. Although school projects can be used if that is all you have, real-world projects are preferred. Ross also suggests you present your projects in a way your audience (the potential employer) will benefit from the information. Start with the current situation (what was the problem), what was your plan/recommendations, and finish with end results (outputs and outcomes). Kristine recommends only including projects that are relevant to the job. Don’t dump a 50-page document on the desk of your potential employer. How do you present your portfolio? First and foremost, the traditional and plain PDF should be your primary document. Although other formats (we list them below) are fun and unique, it is the PDF that will be printed, attached to your resume and circulated among the team. Videos: interview yourself, or do something unique. Website: Own your own name online, buy a domain with your name and use this as a landing page to showcase your projects. Pinterest: check out Kristine’s Pinterest portfolio that she used to apply for her current job. Ross encourages you to read Your LinkedIn profile photo: are you sending the right message? on Hustle and Grind. They say a picture is worth 1,000 words, are you using those 1,000 words to your advantage? Kristine hopes you read the 10 tips for people who get nervous in job interviews. It happens to even the most confident of us, even the hosts of this podcast. Don’t forget to share your opinions, or what is on your mind by writing a comment below, or on our Facebook Page, send us an email or audio note at youngprpros@gmail.com, or send us a message on Twitter @youngprpros. This entry was posted in Young PR Pros podcast and tagged career, career advice, clare bonnyman, communications, data, julia kent, kristine d'arbelles, new career, new job, portfolio, PR, professionals, resume, ross simmonds, young pr pros, youngprpros by Kristine D'Arbelles. Bookmark the permalink. Copyright © 2019 Young PR Pros. All Rights Reserved.